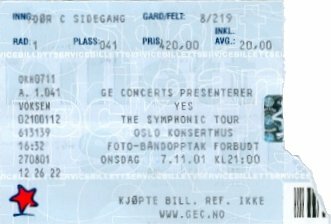 Yes played at Oslo Konserthus (not Konzerthaus - that's German) for capacity crowds (1400 people) at November 7th. What a mind-blowing experience! Me and my friends had 1st row tickets, right in front of Steve!! The concert was just a SERIES of highlights, and during AGP, Jon smiled and handed his tambourine to my friend Sol. Gates, Starship Trooper, LDR, DG, ITPO, Clap/Mood for a Day, and not to mention RITUAL, they were all fantastic. Jon said a lot of weird things and introduced Alan as the "new Rachmaninov" before ITPO. A truly GREAT concert. We were in ecstacy after the show. Me and my friends went down to the artist entrance, where we waited for the band. Fate was on our side - among all the fans and guards, we bumped into some groupies who had just left the building. They sold us their backstage passes in exchange for a kiss (how sweet :-). We were escorted in, and taken to the fourth floor, where Glen and Carl-Michael were already hanging out. We approached Alan, Chris and Tom (who was surrounded by a horde of girls), and they were all very friendly and charming. A friend of mine, Martin, handed Chris his copy of TYA to sign. Chris stared at the cover for a looong time, and commented on the cover (with Tony's broken foot etc.). I asked him if he had any contact with Tony these days. He looked up and smiled. "Tony? Nobody knows where he is. We're trying to find him, you see, we're going to sue him!" Alan and Tom were both really down to earth, and they stayed for about 40 minutes to talk. Jon went in and out of the room, and said funny things. As Alan said: "Jon is kond of a gnome, running around and being mystical". Tom showed great interest in my band Deflower, and we discussed You Were Spiraling and exchanged web addresses. Alan seemed to be very pleased that such young fans were still following them (he told me to thank my father :-), he also bragged about his new Mac laptop (no really! 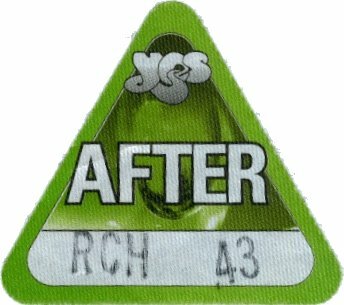 ), and told us a bit about Yes' future plans. It seems Yes are going to record a concert DVD in Amsterdam, and then keep on touring in South America, Japan and **Australia**. Alan said Australia was still not 100% confirmed, but "highly likely".